Justine Hipsky hails from a sunny, insane paradise most commonly known as Florida. She began improvising in the summer of 2014 because she realized that watching 30 Rock for a fourth time did not technically qualify as “social” or “creative.” Justine is a graduate of the Washington Improv Theater training program and currently performs with WIT company ensemble Hellcat, as well as special project shows Citizens’ Watch and Die! Die! Die!. When she’s not obsessing over all things improv, she can be found making to-do lists with easily attainable goals (shower? CHECK! ), spending way too much money on iced coffee, and asking her dog who the prettiest girl in the world is. (It’s her dog.) One day, she’ll actually write in all the journals she keeps buying. Short and sassy, Justine believes that life is weird but makes for great comedy. Everyone's just making it up as they go along, so why not do it together on a stage? Justine moved to DC to be a high school social studies teacher and stayed in DC to be an improv comedy teacher and performer. Hey, life really is a journey. She believes in building a supportive, fun classroom while also really challenging students to expand their comfort zones and put real effort into growing their craft. 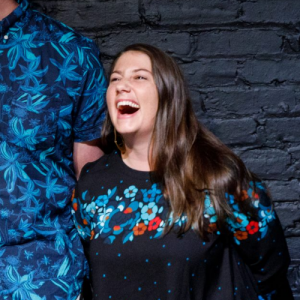 Her absolute favorite part about teaching improv is feeling the joy that comes from students surprising themselves and making connections—between life and comedy as well as between each other. Her love for improv grew wildly after showing up to the first class with sweaty palms and a stomach tied in very intricate knots. She still gets backstage butterflies and hopes that never ever changes. Currently, she performs with WIT company ensemble Hellcat, as well as special project shows Citizens’ Watch and Die! Die! Die!.